The Big Bands is one of the best books on the subject. It is both readable and an invaluable reference source for the study of jazz standards since many were written by big band leaders or musicians or were popularized through their performances and recordings. The index is comprehensive with names but lists no songs. 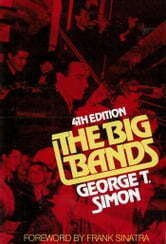 George T. Simon was one of the original organizers and members of the Glenn Miller Orchestra for which he played the drums. He was also one of the first writers for Metronome Magazine where he remained from 1935 until 1955. Dean Martin - A Complete Guide to the "Total Entertainer"